Elvis Enthusiasts Unite: Winner, winner, chicken dinner. 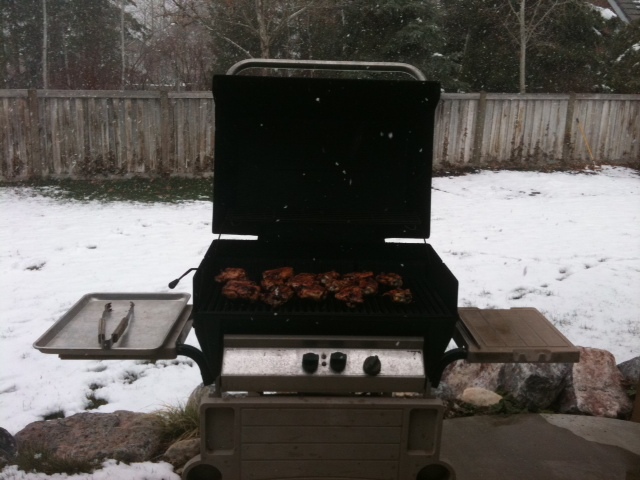 While I'm very, very happy to be far away from the "surprise" foot of snowfall in the pretty, great state of Utah, receiving a photo care of my stepfather celebrating their first BBQ of the "arson" (sic ... ha, I'm pretty sure he meant season) does make me pine for a Sunday dinner with my family tonight. That happens sometimes. Yes, hated the all-day snow yesterday. Today is shaping up nicely though. Mmm, chicken looks yum.